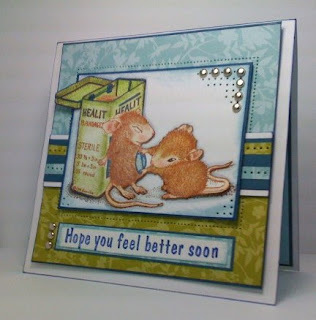 Stamps used here are both by House Mouse Designs from Stampabilities, year 2003. All other products i.e., Designer Series Paper, Brads, CS, Piercing Tool, Signo Gel Pen ar from Stampin' Up! 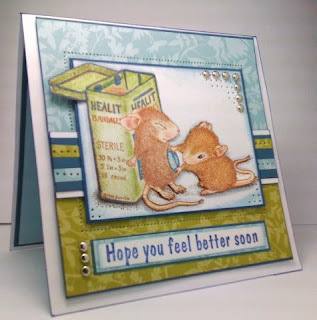 The images are colored in with StarLite Glitter Gel Markers and Chalks from CTMH. Love all the piercing - and how you did the brads over the piercing in the corner!! The coloring on this is FABULOUS and I love this color combo!! Such a cute get well America. I like the piercing! Great colors together too. Oh WOW, this is absolutely adorable!! This card is adorable! I love the image, the colors you used, and your paper piercing is great! Thanks for the smiles. So cute America, I love the peircing too.